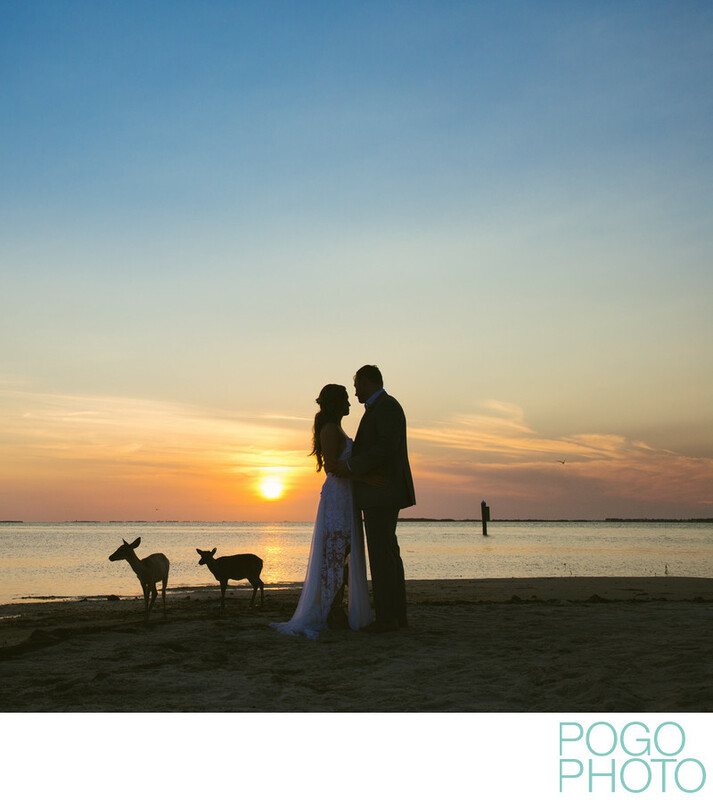 When photographing weddings on Little Palm Island we always enjoy playing with the colors and light created by a Florida Keys sunset, but when our bride and groom are joined by some of the endangered Key deer living on the island, the resulting images can be amazing. Scheduling plenty of time for couple portraits on the wedding day gives newlyweds a chance to take a few private moments away from the craziness of their wedding days and lets them fully relax in front of our lenses. Portrait time can actually happen before or after the ceremony, provided a pre-determined schedule is followed fairly closely. Couples in recent years have wanted to attend their cocktail hours to spend more time with friends and loved ones, a block of time traditionally set aside for couple and family portraits. This has led, in part, to a majority of couples embracing the previously taboo idea of having a first look. Seeing each other before the ceremony helps calm the nerves during the ceremony, but also allows for a more streamlined day. We chose to have a first look at our wedding, followed by portraits of just the two of us, and then family formal pictures. This order of events let our day grow progressively, staring with just our immediate families present at the beginning of the day, then the extended family for formals, followed by all of the guests a half hour before the ceremony. This also gave us not one, but two times for couple portraits throughout the day. The couple in this photo chose to have a first look and scheduled portrait time in the afternoon and evening, a great choice to use the ample Florida sunshine to its fullest extent. The Florida Keys are a popular wedding destination for people in South Florida and across the country. The thought of experiencing February temperatures in the mid-70s draws a great number of couples looking for an excuse to flee the wintry conditions of the northern states, using their weddings as a reason to come frolic in the sand. Floridians also love Keys weddings, as most of them have taken numerous road trips down the Overseas Highway over the years. The Upper Keys, including Key Largo, are only about an hour’s drive south of Miami, so even for couples and guests flying in from out of town the Florida Keys are easily accessible. Flying into Key West is also possible, but most people choose to drive at least some of the 113 mile long series of bridges and island roads that make up the Overseas Highway. Originally built by Henry Flagler as an extension of the East Coast Railway connecting the mainland to the southernmost point in the contiguous United States, this former rail route turned highway is consistently rated as one of the ten best drives in the country. Entering and exiting the Keys over this famed strip of road only enhances the memories associated with weddings held in the Upper or Lower Keys. To make things even more distinctive, couples may choose Little Palm Island as a venue, as access to the private island requires a boat trip over three miles of open water. Location: Little Palm Island Resort and Spa, 28500 Overseas Hwy, Little Torch Key, FL 33042. 1/500; f/8.0; ISO 800; 35.0 mm.